SAIL Groups and Activities--Call or email SAIL for more information! SAIL members take an active role in planning programs and in providing feedback, advice, and information to SAIL staff. 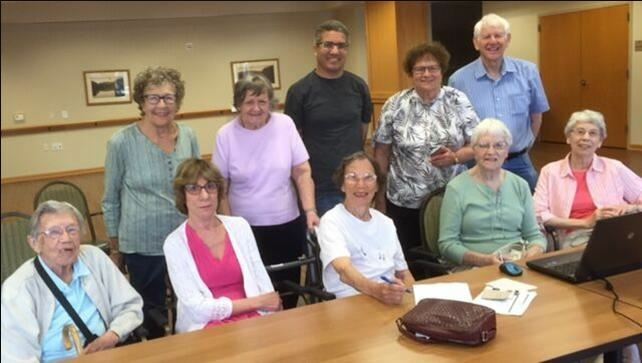 This group meets the third Wednesday of every month at 1:30 p.m. at Oakwood Heritage Oaks and welcomes new members. The Book Club started back in 2005, making it the oldest of the SAIL member groups. Call the SAIL office for more information on meeting dates and locations. You are welcome to join the group at anytime throughout the year. The Lunch Bunch is a gathering of SAIL members that meets monthly at a local restaurant to enjoy good food and an opportunity to socialize. The SAIL Lunch Bunch has two volunteer leaders who choose a restaurant on Madison's west side and on Madison's east side each month. The SAIL Explorers’ maiden voyage began in August of 2011. Since it began, members have had the opportunity to travel by bus to Epic Systems, the Children’s Museum, the Chazen Museum, the New Glarus Brewery, and more. The men’s group began in 2011. Each month the men of SAIL enjoy coffee, rolls and lots of great discussion on a specific topic suggested by attendees the month prior. Led by Fred Ross, the Men's Roundtable meets the second Tuesday of the month at 10:00 a.m. at the Oakwood University Woods campus in the Social Room. This is SAIL's newest member group. It began in February 2016 with approximately 25 members attending the first meeting. The group includes members who are single and do not have a family support system. The group meets monthly for educational or social purposes. They are working on developing a support system within the group. Throughout the year SAIL offers members the opportunity to participate in a series of educational programs that provide them with invaluable information regarding their health and well-being. Falls prevention is an on-going program at SAIL. Members are invited to SAIL– sponsored classes that help improve strength and balance. Staying connected in the community is a priority for SAIL. We encourage members to participate in various educational and social opportunities offered by the University of Wisconsin, PLATO, MATC, State of Wisconsin, University League, and more. This allows us to expand our knowledge base, resources, and our friendships. In addition, we are a proud member of the following organizations: CWAG-Coalition of Wisconsin Aging Groups, Safe Communities Falls Prevention Task Force, Dane County Continuity of Care, the Village to Village Network, and TRIAD. 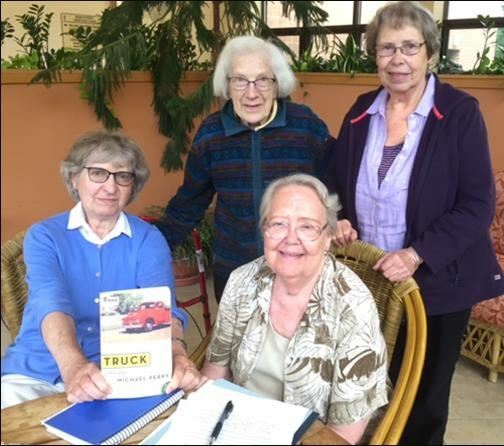 Charter Book Club Members sitting L to R): Maria Schnos, Alice Punwar, (standing L to R) Joan Box, and Johana Ghei. Founded by Alice Punwar in 2006, this is our longest running member group. Be sure to join them following summer break! Above: SAIL Members attend live training demonstration on YouTube.